1. I would be willing to spend my money watching an excellent play because I would love to have at least an experience watching a real play. I have never watched a play before. This would be helpful for me to get knowledge on how drama is being act. It is also important for my study as I am studying about drama. 2. I expect a good play would have a beautiful plot and of course a satisfying ending to the viewers. I hope the actors could play their roles properly in the play. 3. I don't feel good to act in a play because I don't know much on how to act. However, I will study more on acting and will try my best if I'm being asked to act in a play someday. 1)Would I be willing to spend my money watching an excellent play/drama? Why? 2)What do I expect from a good play? 3)Do I feel comfortable to act in a play? Why? -Yes, because an excellent play or drama will widen my perspectives about the play. All this time, I have never watch play and if someday I will be given a great chance to watch it, I will go. Furthermore, an excellent drama or play has their own uniqueness and creativity. So, I have to watch different genre of drama or play to explore more about it. As I will be learning about dramas and plays in this semester, I need to have passion about it. -The flow of the story will attract many people to watch it. The director of the play should be as creative as they can because nowadays, they are so many cliché storyline. The people will get bored if they watched the same storyline even though different titles because they need some fresh story to watch. Apart from that, the main characters in the play also play a main role to make the play excellent. They need to act as best as their can to make the audience impressed of their performances. The prop and sets on the stage also will make the play as good as others. - No, I will not feel comfortable to act in a play because I am not good in acting. Maybe, I have some problems to memorise the script. I think if I act in any of the play, I will make the play miserable and the audience will say that I have destroyed the whole of the play. I don’t want that happen. But, if I have given the chance to act, I will make it as best as I can because I don’t any bad thoughts from the audience.In this semester I will learn some of the drama and for sure, we need to act to feel the experience and I will grab the opportunities to act well. 1. Overwhelmingly yes, this is because I have lack of knowledge about drama or play. So I must add on and gain more knowledge about an excellent drama so I will be more understand about the drama. Besides that, the actor or actress definitely will give their 100% effort to make us entertain by watching their acting. In directly it is benefits for us to watch an excellent drama as we are studying about it. 2. I have a high expectation from a good play. The most important is I hope the plot or the story line is remarkable and easily to understand. Then, all the actors and actresses surely must have a good skill to make the character live so we as the audience can feel the aura that the actor trying to deliver. Moreover, the costumes play a big role to make the drama successfully done. 3. I do feel uncomfortable to act in play. This is not because I don’t have any courage to take the challenge it is because I don’t have an experience how to act. If I was given a chance to act in drama I will put an effort and give 100% commitment to give my best. 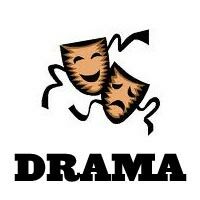 In directly if we act in drama we also can learn how to produce a good drama and can have better understand about the drama. 1. I will definitely say yes. For some people, they might think that spending their money on drama/play is a waste, but actually it isn't. As long as the drama is excellent and good, it is really worth. Excellent play gives a wonderful satisfaction. When people spend their money on any play or drama, they will expect to see a drama which can give them a satisfaction on it. I want to feel that satisfaction. Besides, an excellent drama can entertain myself and release my stress. Other than that, I can learn something new from a drama. 2. I am a person which love comedy and also action. Fantasy is great too. Different play, different expectation. If people said that there is a drama which is very excellent, means that I will have a very high expectation on it. I expect not to see any mistakes although if it is just minor mistake in a drama. Forget the scripts, bad plot and others are the mistakes that I hope I won't see on any play. I really hope that the actors and actresses are excellent and act with a very high level confident so that people will enjoy their performance. Not just that, the plot also must be interesting. I hope that the plot can give an impact not just to me, but also to the other audience. Finally, I hope to see a little bit of humor elements in a play. 3. I don't think so that I will comfortable to act in a play. This is because whenever it comes to drama practice, I can memorize the script really well, but when it comes to perform in front of people, I will easily forget the script because I'm quite afraid to act or to perform in front of the crowd. Acting needs 100% confident level, 100% commitment and also 100% feel. I don't think so that I can give that much to act but if I got a chance to act, I hope that I can do well.